Going to Batad wasn’t the easiest thing to do, yet it’s one of the most rewarding ones. Not only had this trip been one of the cheapest weekend getaways I’ve had, but the views also definitely made the long journey worthwhile. For those of you planning a trip to Batad, here are some practical guidelines. Banaue is nine hours from Manila. The bus has two stopovers: one in San Miguel, Bulacan and the other in Aritao, Nueva Vizcaya. 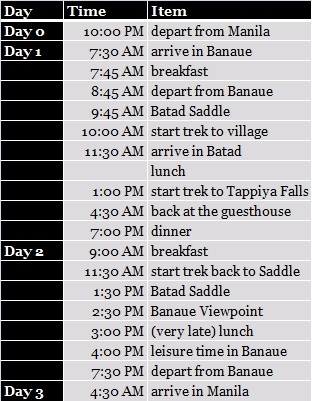 The ride from Banaue to Batad Saddle takes one hour. Trekking from the Saddle to the village takes at least an hour, but could easily become two. I’m lucky to have shared the jeepney rides and food expenses to nine other friends, such that our costs significantly lowered. 🙂 Food is expensive in Batad (maybe not for foreigners), as a meal costs around P150-200, a liter of water for P80 and a can of soda for P65! 1. Book your bus tickets in advance. If you’re going on a Friday evening, make sure to really book ahead. Buses fill up, and you’d be very unlucky if you’d have to sit on the aisle for nine grueling hours. Upon arrival in Banaue, buy your tickets back to Manila. 2. Do not pre-book your jeepney ride to the Saddle, or you would pay at least 40% more. Locals will offer you their jeepneys as soon as you disembark from the bus. If doing a return trip, make sure to confirm with your driver when and where to pick you up. See number 5. 3. Hiring a guide isn’t mandatory, but it’s nice to have one for the stories. Workers at tourism establishments aren’t the friendliest of people, but some locals are helpful. 4. Wear trekking sandals instead of shoes. 5. Batad is remote. There is no cellphone signal in the village, except for the intermittent signal at the tourism office. 6. From Batad, you can hike to Bangaan, another cluster of rice terraces hailed as a UNESCO world heritage site. You can ask your driver to just pick you up from there, with an additional fee of P500. 8. 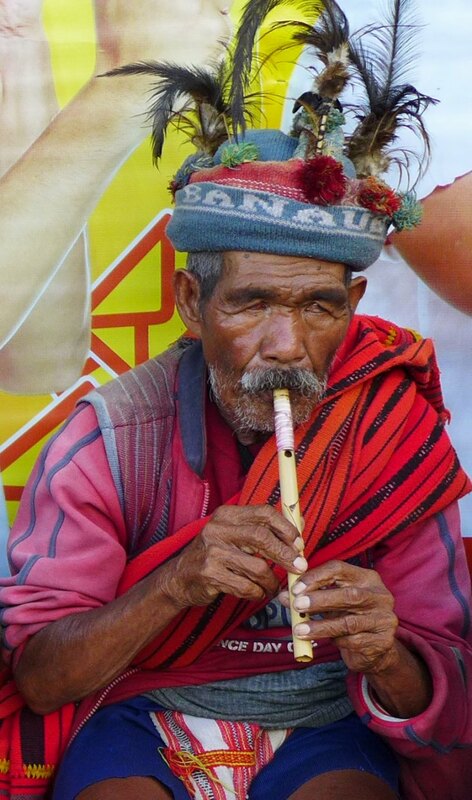 In Banaue, head to the Viewpoint if you’d like to see some locals dressed in their native costume. Donations are required if you take their photos. Got more questions about Batad or Banaue? Just post it below. Just a question, why is it preferable to wear sandals than shoes? When we’ll arrive in banaue we won’t know when to come back to Manila !!! Is it possible to book the bus ticket only 1 day before Please ? P.S. I think Dangwa Bus also plies the Manila-Banaue v.v. route. I saw a bus leave from Florida bus station in Cubao, but I’ve never tried that bus though.